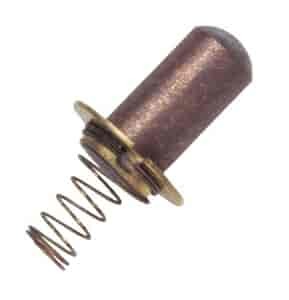 Low Resistance of 1-3 Ohms. The rotor bushing used in stock HEI distributor caps are made from high resistance carbon to help supress radio frequency interference. When the high voltage of an MSD ignition is added, this resistance may build up excessive heat which may damage the distributor cap and rotor. The solution to this problem is the MSD Low Resistance HEI Bushing which allows the secondary voltage to be transfered from the distributor cap to the rotor without excessive heat buildup. 8412 is rated 5.0 out of 5 by 2. Rated 5 out of 5 by Debi from Distributor bushing Just want I needed to replace my old worn out bushing.